As a food blogger, I don’t repeat recipes very often. I’ve made this Buffalo Chicken Potato Soup three times in one month. That’s how good it is, and how much my family loves it. We’re pretty tolerant of spicy foods, so take that into consideration when I say it’s really not too spicy, even for my 9 year-old. And you can always use less hot sauce. In fact, I recommend adding the hot sauce gradually the first time you make this soup, so you can figure out exactly how much heat you want. You can always serve more hot sauce on the side for the folks who like it extra spicy! Frank’s Red Hot is our hot sauce of choice, but feel free to use your favorite brand. 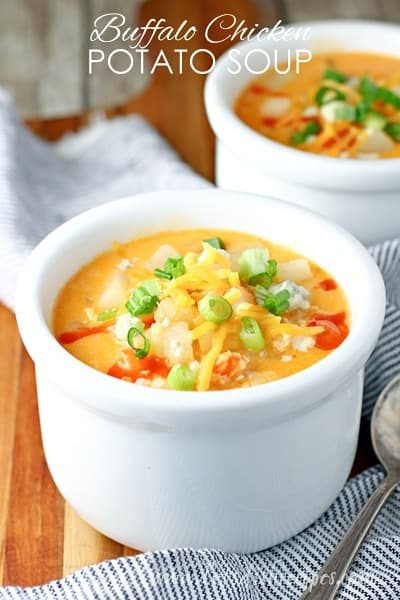 The soup is absolutely delicious on its own, but blue cheese crumbles, shredded Cheddar cheese and chopped green onions make great toppings. We also like to stir in a dollop of Ranch or blue cheese dressing. Best of all, this soup is on the table in about 30 minutes (I use a supermarket rotisserie chicken to speed things up even more) and I get no complaints about what’s for dinner. 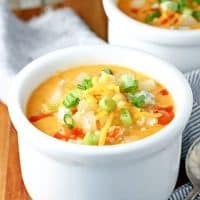 I have some serious Buffalo chicken fans at my house, and it’s safe to say this is one of their favorite soup recipes of all time! 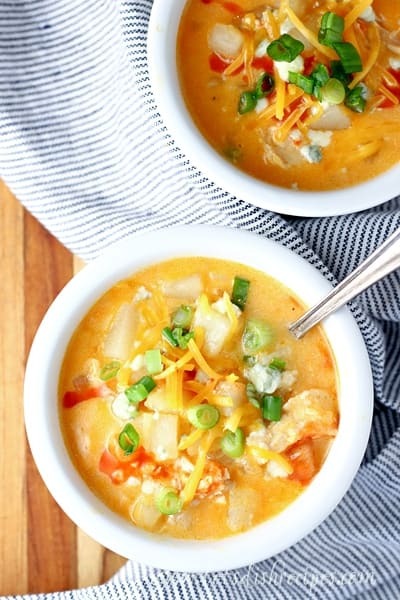 Be sure to save this Buffalo Chicken Potato Soup recipe to your favorite Pinterest board for later. Heat butter in a large pot over medium heat. Add onions and garlic and cook until tender, 2-3 minutes. Stir in flour and continue to cook for another 1-2 minutes. Add the chicken broth to the pot and stir until smooth. Bring to a boil and add potatoes. Simmer for 10-12 minutes, or until potatoes are just tender. Stir in Buffalo sauce. Add cream cheese and simmer, stirring frequently for about 5 minutes, or until cream cheese is mostly melted and smooth. Add Cheddar and Parmesan cheese and continue stirring until all of the cheese is melted. 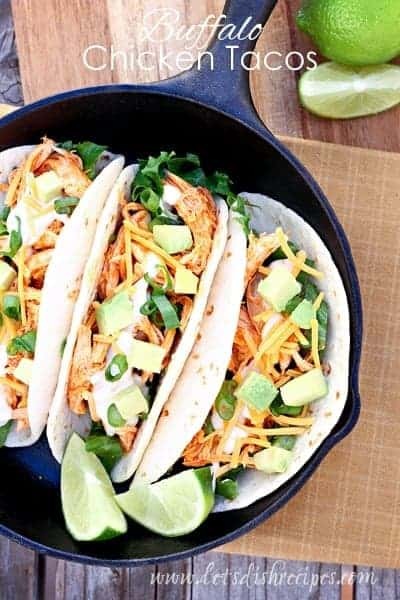 Stir in cooked, shredded chicken. Season with salt and pepper, to taste. Simmer for an addition 5-10 minutes. Serve with optional toppings, if desired. 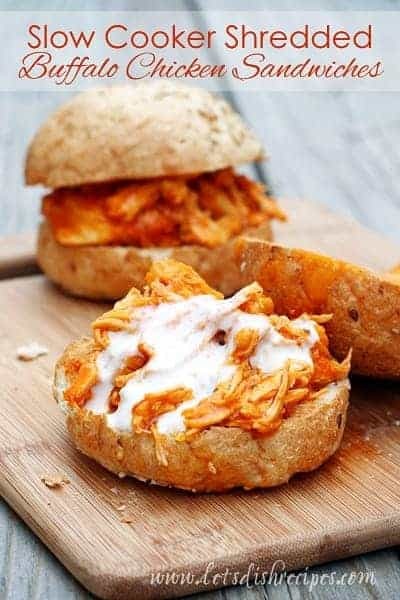 Who Dished It Up First: My friend Micah sent me a recipe for Buffalo Chicken Soup. 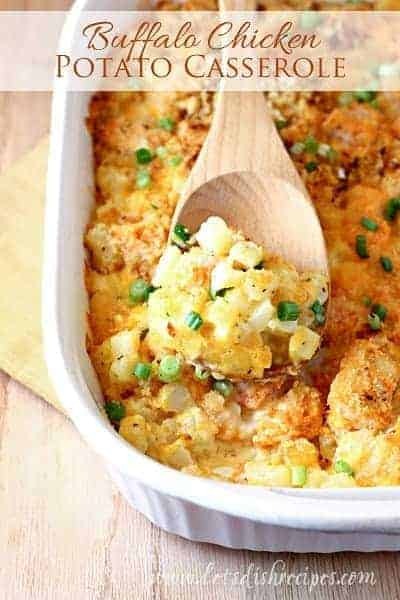 I added potatoes and made a few other changes to create this recipe. brilliant idea! I can see why your family loves it. YUM! What a great recipe! I love all of the ingredients in this soup. This is on the ‘must make’ list! Soon as it gets below 60 in Utah I will make it! Probably this weekend. We loved this! One time I accidentally hot sauce and buffalo sauce. It was still amazing. I absolutely loved the flavor of this soup but there was way too much liquid for my liking as written. I will totally make it again but only use half the broth.